In a dystopian society, closers are hired by grieving families to impersonate a deceased child and give the family a chance at closure. Quinlan McKee is the best closer there is, but then she discovers that everything she has ever believed is a lie. Not sure who she can trust, Quinn flees her controlling employers and sets out to discover who she really is, uncovering far more than she could imagine. Quinn is a sympathetic character and readers will want her and fellow closer on the run, Deacon, to succeed in their mission and their relationship. Suzanne Young's latest book perfectly illustrates how good intentions can lead to horrible results. An effort to save people from pain and grief actually causes much more damage than simply letting people feel hurt. The Epidemic is the sequel to The Remedy and both novels serve as companion books that lead to the events in Young's popular Program duology. 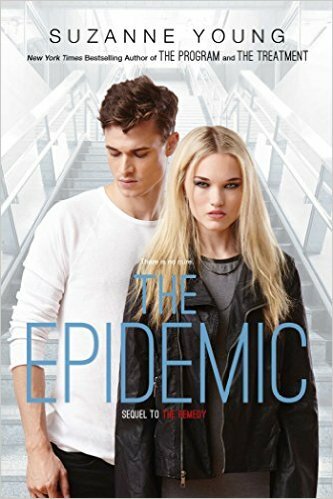 Although this new duology can stand on its own, teens who have read The Program and The Treatment already will finish The Epidemic with a deeper understanding of how and why society could wind up like it did. Readers who have not read the Program duology yet will be interested enough to continue with Young's unique dystopian world. I'm an Amazon Associate now. If you click on the Amazon links and buy anything I might make a tiny bit of money.